U.S Air Marshall Bill Marks (Liam Neeson) gets aboard a new flight, despite his overwhelming fear of airplane take-offs. Having already had run-ins with a few fellow passengers, and seemingly making friends with the woman sat beside him (Julianne Moore), his flying experience gets a whole lot worse when, mid way across the Atlantic, an anonymous passenger messages him informing him that someone will die every twenty minutes unless a large supply of money is credited into a specific bank account. Whilst the ground security pass this off as a false alarm, soon the body count rises, and with the passengers turning against Marks by the minute, the situation is about to become even worse. Liam Neeson and action films are a curious mix. I mean, that whimsy guy from Love Actually wielding a gun and threatening to find and kill people? The film that kick-started this was essentially 2008's Taken, which I personally found exceedingly difficult to like. The characters were dull, the story was unoriginal and it became so monotonously repetitive I began wishing he'd just give up and go home. However, and so pleasing it is to say, Non-Stop is remarkably better than Taken not only in terms of action, but most other elements too. Whilst it's hardly a flawless film, and it really loses itself in its final act, for the most part the fun in Non-Stop is, well, non stop. The sole force that interested me about Non-Stop was its concept. Plane based films aren't exactly a rarity, but they are consistently interesting. What I loved here is that once we board this plane with Marks, we don't leave. We follow him, and very rarely does the camera leave his side. Occasionally the camerawork falls into more conventional action territory, but for the majority, this is pretty good stuff. It's refreshing to see an action film that allows us to see and follow the action, and not rely entirely on fast zooms and quick cuts. The story itself is also nicely done. The plot bounces along at an effective pace, and the explosive (although a bit too explosive) final act comes at exactly the right time; it is neither dragged out, nor cut short. Whether the idea of multiple homicides taking place on a passenger airline is entirely plausible is down to the respective viewer, but as long as you don't think too hard about it, it is believable. Again, until the final act. Neeson's acting is solid too, bar the occasional grunt/growl/wild animal impression, and Moore plays his sidekick well. It was also nice to see Lupita Nyong'o's face to flash up here and there, fresh off her Academy Award victory. However, as repeatedly stated, Non-Stop begins to fall apart in its final twenty minutes. I won't leave spoilers for those who are yet to see this, but for those that already have, you must know what I mean, right? For what began as a pretty smart and effectively produced little action film, Non-Stop spontaneously goes high-wire, with no word of warning. Whilst it is undeniably tense, it just feels like too much. This worked best when it was small; an airplane is an incredible set piece, and it is used effectively until this point. The script is hardly perfect either, but you'd be daft to expect otherwise. Also, does Marks really have to have such an annoying text-tone? Hang on, should his phone even be switched on whilst on a moving aircraft? But, mostly, Non-Stop is a blast. Whilst it does lose some of its effectiveness towards the end, the first two acts are great fun. In the film's big reveal, there is an attempt of a moral to this story, and this will divide viewers. Whilst it will make you think, and does almost make sense, it doesn't feel entirely necessary, and begins to make you question as to why the events of this film actually happened. Whilst Non-Stop is always fun, and the tension is brilliant from the offset, I just can't help but feel incredibly disappointed with the way the film goes in its final twenty minutes. I was aware that every twenty minutes a death would occur, I just didn't realise that the film itself would be the final casualty. Go in to this with the expectations of a conventional action flick with decent acting and a nice set up, otherwise you'll come out disappointed. And it may also be best to leave your brain at the door. That might help too. 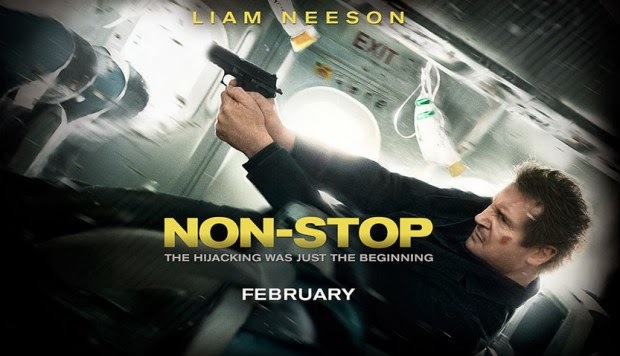 To Summarise: Despite a catastrophic final act and its cliché-ridden script, Non Stop is an undeniably tense, original and effective thrill ride. Neeson and the rest of this supporting cast gives the material some levity, so at least it has that, and a bunch of fun going for it. Good review Morris. Yeah, no-one can fault the acting or the level of fun here. Cheers!